ATLANTA, September 18, 2018 – A study commissioned by the Cobb County Chamber of Commerce has determined that SunTrust Park and The Battery Atlanta are driving an average, total, net fiscal impact of approximately $18.9 million annually for Cobb County. Conducted by the Georgia Tech Center for Economic Development Research (CEDR), this is the first comprehensive fiscal impact study of the ballpark and adjacent mixed-use development, as well as the first analysis of the resulting Halo Effect in the surrounding area of influence. In all, the analysis concluded that the average combined impact of SunTrust Park, The Battery Atlanta and the resulting Halo Effect to the people of Cobb County, through their government and schools, is $18.9 million per year. This includes $3.98 million to the Cobb County Government and $14.93 million annually to Cobb County Schools over the next 20 years. In building SunTrust Park and The Battery Atlanta concurrently, Cobb County and the Braves changed the traditional model for a public-private partnership. SunTrust Park was constructed as a partnership between the Cobb-Marietta Coliseum Authority and the Braves, with Cobb County contributing $300 million to the project and the Braves contributing $372 million. 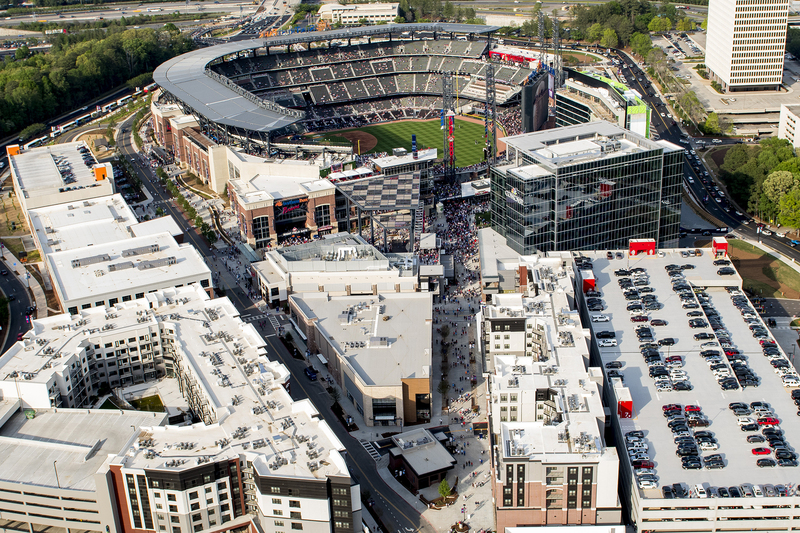 Separately, the Braves and their partners are investing more than $700 million into the mixed-use development, The Battery Atlanta, which was critical to Cobb County’s decision to contribute to the development of the ballpark. The Braves’ investment is having an immediate impact on the community’s bottom line. After less than two years of operation – including an opening season where The Battery Atlanta was only partially open – the study shows there already is a strong return on those investments. In addition to the direct impact the projects are having on the community, CEDR experts were able to use a previously defined area of influence for the Cumberland CID to help gauge the Halo Effect SunTrust Park and The Battery Atlanta are having on the surrounding region. The research shows that property values in the area have soared by approximately $4.5 billion from 2013, when the ballpark was announced, to present day. These findings reinforce existing data showing the growth in the area, including $1 billion in planned development unrelated to the Braves in the Cumberland CID, 1,400 new rooms in six hotels in the area, and the construction or planning of six new Class A offices in the CID since the ballpark’s announcement. The combined annual net fiscal impact of SunTrust Park and The Battery Atlanta to the Cobb County Government is effectively revenue neutral on an average annual basis. The combined annual net fiscal impact of SunTrust Park and The Battery Atlanta to Cobb County Schools is $6.3 million per year. When considering the Halo Effect, the annual, average net fiscal impact increases an additional $4.0 million for the Cobb County Government and $8.7 million for Cobb County Schools. All told, the combined impact of SunTrust Park, The Battery Atlanta and the resulting Halo Effect to the people of Cobb County is $4.0 million for the Cobb County Government and $14.9 million for the Cobb County Schools, for a total of $18.9 million per year. To develop the report, CEDR staff coordinated with the Cobb County Tax Assessor’s office to access the most up-to-date financial data. Additionally, the staff conducted several interviews and briefings with representatives from the Cobb County Chamber of Commerce, Cumberland CID, Cobb County Tax Assessor’s office and the Atlanta Braves. View the complete fiscal impact report at www.cobbchamber.org/fiscalimpact. The Center for Economic Development Research is a unit of the Enterprise Innovation Institute, Georgia Tech’s chief business outreach and economic development organization. Its core mission is to help business, industry, entrepreneurs, and economic developers across Georgia grow and remain competitive. Previous articleAcai Express Opening Two New Superfood Shops – On Fast Track to U.S. Expansion.